Each year CIFE awards prizes to exceptional students from member colleges and we’re delighted to announce that two CIC students received CIFE awards this year.Tian Jin won an Andrew Osmond Maths award and Faith Ndungwani won the Chelsea College Award. Tian Jin came to study for his A Levels with Chelsea Independent College in January 2012, after completing his second year of High School in China. He achieved an outstanding 3 A* grades in Mathematics, Further Mathematics and Chemistry. He is a talented and highly motivated individual with an excellent work ethic and great ambition. Mathematics is Tian Jin’s passion. It was obvious to all how much he relished solving challenging problems. He was awarded Gold in the Senior Maths Challenge UKMT and currently reads Mathematics at Oxford University. Faith achieved an excellent set of A Levels with us in 2013, grade A in Biology and Chemistry and A* in Mathematics. Faith is a bright, highly motivated and committed student and is held in great esteem by everyone in the college. Her leadership skills were demonstrated repeatedly in the organisation of fund-raising events and she showed great maturity when representing the college at recruitment events. Her friendly, considerate and supportive approach was much appreciated assisting new students settle into the college. Faith’s ambition is to become a doctor and her drive to fulfil this led to her taking a gap year in order to apply to read medicine. 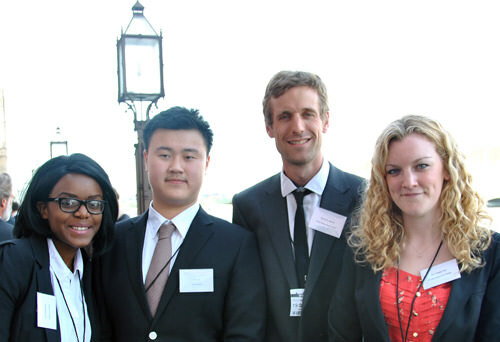 The picture below shows the award winners with two members of CiC staff and was taken at the CIFE Prize-giving ceremony held at the House of Lords.